(May 5, 2011) ‘If the Invader Comes’ is a new film installation by photographer Dan Dubowitz and choreographer Fearghus Ó Conchúir that reflects the powerful psychological impact of being in a state of constant vigilance. The art work responds to the Martello Towers of England’s East Coast and to the ‘land’s end’ psyche of their coastal communities, but in doing so it connects to the nation’s ongoing state of alert against enemies both seen and unseen. Dubowitz and Ó Conchúir’s triptych of lingering and meditative images draws the viewer into the world of the watch-keeper, and evokes his internalization of the pervasive menace of invasion. Two hundred years on, we may no longer be on the lookout for an enemy fleet but we are still on high alert. Who or what is the threat we wait for? Could it be with us already? While the Napoleonic enemy was clear when these Martello Towers were built, the threats we face today take different forms. A report commissioned by the Association of British Insurers confirms that the East Coast of England is at risk from rising sea levels. Some of the area’s Martello Towers have already been lost to coastal erosion so the threat is serious. ‘If the Invader Comes’ is the second collaboration by Dubowitz and Ó Conchúir that investigates the relationship between people and place. 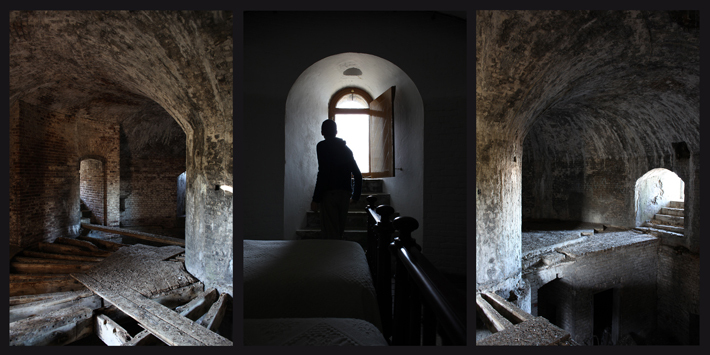 The film installation will be shown alongside their first joint work, ‘Tattered Outlaws of History’, a 12 film artwork that imaginatively reconnects the Martello Towers of north County Dublin. Bringing both installations together in a single exhibition, the artists make connections across the boundaries that the towers were designed to protect. 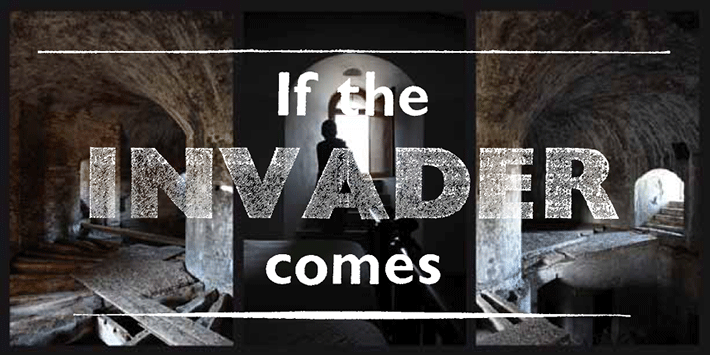 ‘If the Invader Comes’ is commissioned by Commissions East as part of Fleet: Art in the Haven Ports. ‘Tattered Outlaws of History’ is a Per Cent for Art Commission for Fingal County Council. Summer Opening Hours: (April-Sept) Wed-Sun, Bank Holiday Mon 10am – 5pm. Visit www.jaywickmartellotower.org for more information.